A number of factors are fueling the demand for a new, intelligent approach to IP Address Management (IPAM). This document describes these factors while highlighting deficiencies in the legacy IPAM solutions and manual management techniques commonly used today. 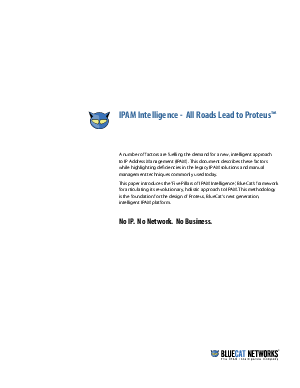 It also introduces the 'Five Pillars of IPAM Intelligence', BlueCat's framework for articulating its revolutionary, holistic approach to IPAM, and the foundation for the design of Proteus, BlueCat's next generation, intelligent IPAM platform.